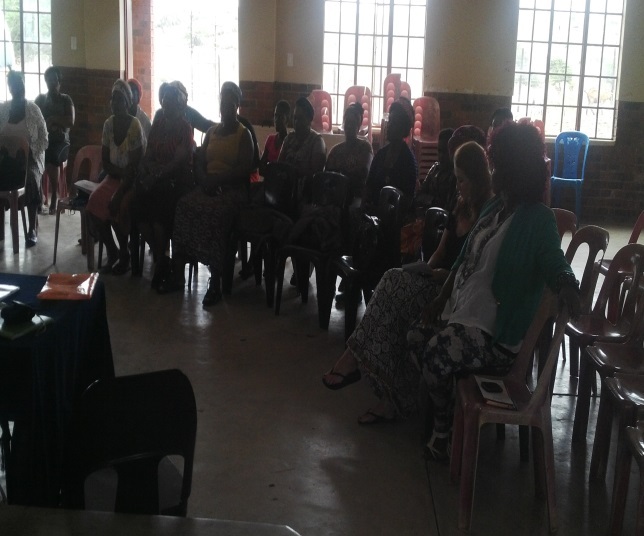 Another platform for women to meet and discuss their issues, whilst devising a concomitant strategy that will result in robust action, was created through a meeting held in Ocilwane community hall in Fuleni. 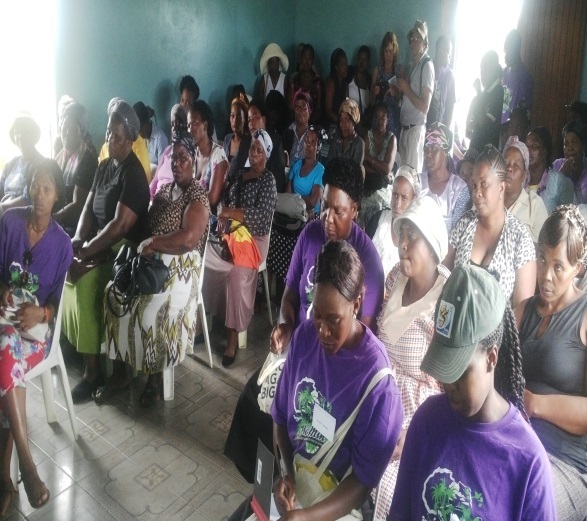 This once again brought Fuleni women together with their sisters from Somkhele’s Machibini and Dubelenkunzi villages. This time round, Cde Nomonde, born in Mpumalanga’s mining township called Mutsi just outside Witbank, was amongst us. She came specifically to share her terrible and mining affected upbringing. 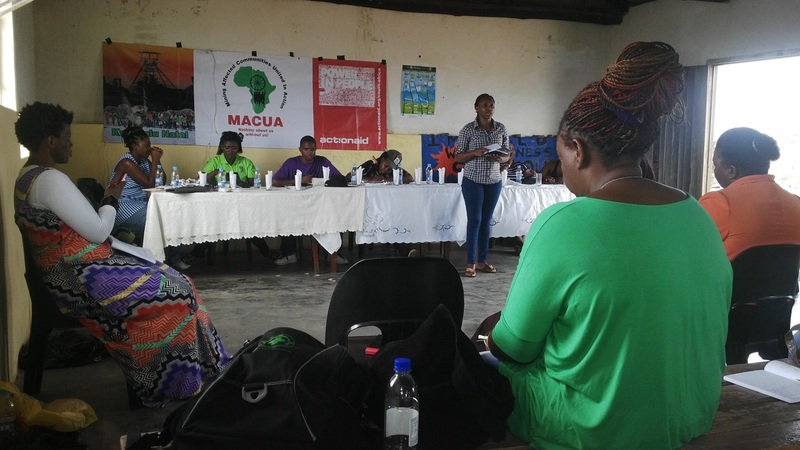 In her testimony, Nomonde spoke about the world’s known “secret” in the mining industry with which mining houses bombard communities when approaching them for their ancestral land – “promises, promises and more unfulfilled promises”. Cde Nomonde recalls vividly how the news of a mine brought about disgruntlement in her community but even worse her homestead. She goes on to say “ no matter what we were doing as a family, the moment the word MINE was uttered, tranquility and tolerance would quickly fly out of the window. The topic under discussion before that was never finished. Little did I understand back then but today, there is no need to, because I am a living example of why our parents and older siblings fought and most of them are no longer alive today”. After her emotional, intriguing and riveting heart-to-heart outpouring and testimony, Nomonde went on to encourage women from both communities, “If you have nothing to die for then you have nothing to live for. If you stand up against what you believe is not ethical, you must stand up even if you stand alone but you are blessed because you are not alone. We are woman from all walks of life and from different provinces, most unique and above all we are all women”. Nomonde closed her testimony with a song which saw everyone standing to sing and ululate simultaneously. Immediately after Cde Nomonde spoke came a woman who introduced herself as Thandiwe from Ocilwane. She first thanked Nomonde for her testimony and went on to unleash her confession. 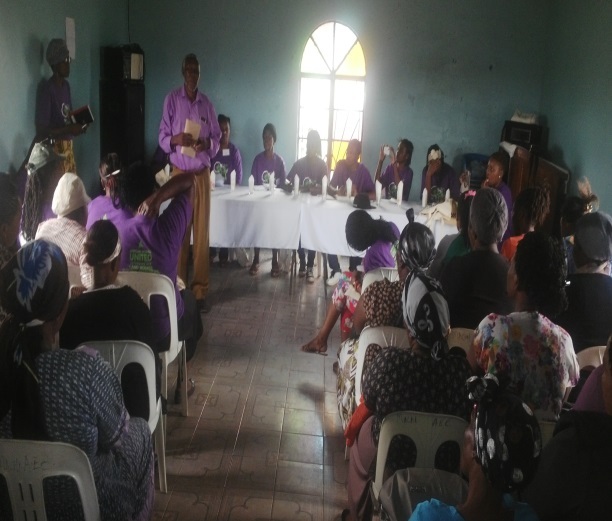 She began by saying “I have been seeing people going to meetings of this magnitude in our village as well as other villages but I have never bothered myself to attend because meetings are held almost every day but nothing comes to fruition. Today, I am not only changed but I am also moved. Indeed we are blessed in Ocilwane to have people talking like this before the mine begins its operations. Can you imagine what would we be saying to Sis Nomonde if they came to us after the mine has begun. One of the primary reasons I came here is that my father had 38 cattle and today we are left with 8, three of which might die anytime, all due to the drought we are currently experiencing. Something we have never had before. Surely there is something wrong therefore we have to stand up and fight for our livelihoods” concluded Thandiwe, who was later selected to represent Ocilwane together with one woman from Ntuthunga and two from Somkhele to attend the regional exchange in Johannesburg from the 19th to 24th January. I stayed over in Richards Bay on the 7th and then was picked up by Sheila and Rob on the N2. Together we drove to Nyalazi Gate, HiP, to meet our Wilderness Leadership School trail guides, Mandla Gumede and Sipho ?? and senior guide, 81 year old Baba Mdiceni Gumede, and our co-trailists, four musicians from the Natal Philharmonic Orchestra: Simon Milliken, Stella Martin, and Thomas and Linor Steinhausen. This experience will be another report on its own. 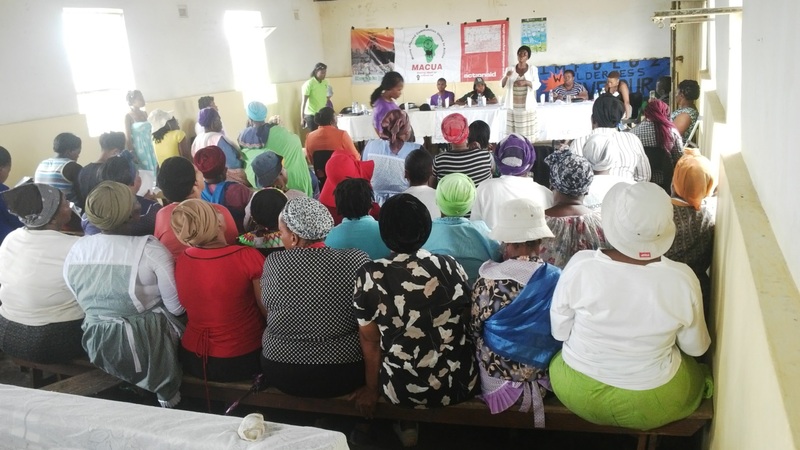 The tour to KwaZulu-Natal of the regional exchange brought woman from Mozambique, Zambia, Zimbabwe, Botswana and various parts of South Africa, from provinces affected by mining. A few men made their way to the Zulu Kingdom in a supporting role. Our day began with a meeting at the church in Machibini village not far from the old main entrance of the mine. The hall was packed to capacity which resulted in some people having to listen from outside. 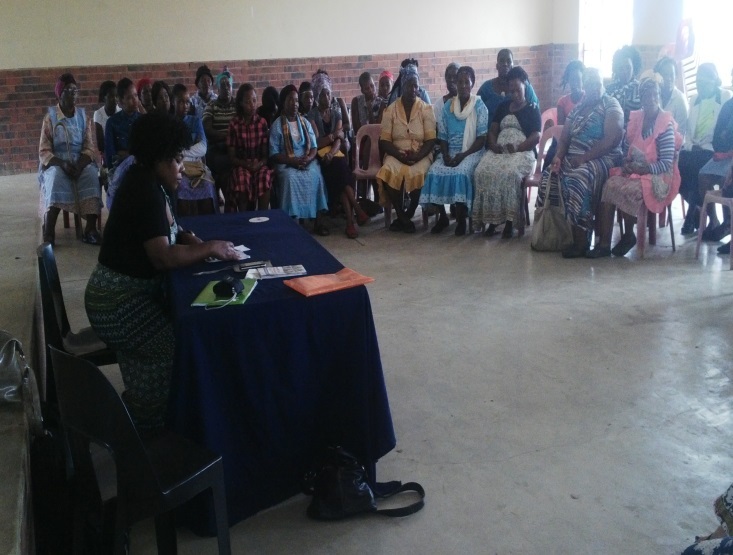 Both villages from Somkhele were present plus a taxi from Ocilwane, which contributed to the capacity witnessed. The 4 delegates plus our 2 woman provincial representatives of the calibre of Zama Ntuli and Winnie Mthembu, were advised to go and explore other provinces with the rest of the tours which saw other groups visit Mpumalanga and some parts of Gauteng so that when they return home, a report back meeting will be held at a venue to be confirmed thus giving our comrades an opportunity to report to us and also learn from woman of other provinces as to how have they actively participated in their struggles on their respective home soil. Since GET was the hosting organization in KZN, all correspondence came through to us hence the media release was posted on our website. (Well done to our web master, Rob Symons, for doing this so swiftly.) Consequently a lot of hype was treated within the media. Media houses such as the SABC-TV AND RADIO NEWS showed great interest with the TV News reporter, Mlondi Radebe (083 284 9163 email: mlondi.radebe@gmail.com) having called to make known to me his angle of the story. Together we were going to attend the meeting scheduled for the morning at Ocilwane, on 22 January, and later go to Somkhele where he wanted to conduct interviews with members of the community I had already identified and then proceed to see the grave sites as well as cracked walls of the respective houses. Unfortunately Mlondi couldn’t make it to do our story because his superior sent him to another story but also the mining sector and also on the border of iMfolozi. He was sent to cover Zululand Anthracite Colliery where workers were refusing to leave the mine shaft. I asked him to establish some contacts for us since we haven’t yet penetrated in that community. Andrea Abbott, a freelance writer and contributor for different publications locally and internationally, made her way to our lodge early on Wednesday before we left for Somkhele. She was then briefed by myself about GET’s work in both communities and what do we intend doing moving forward because she appeared to be clued up about the regional exchange. To balance her story she had to do some digging from the mine. She had a lot of questions from the P.R. she witnessed on the mine’s website so she wanted advice from me. I told her to contact the mine, specifically Joyce. I did not have her contact details but she promised to take it up. Unfortunately she had to leave quickly after visiting the grave sites and the cracked houses. She departed before Sheila could join us. We then proceeded to visit the gravesite at Machibini village where people were shocked to find the appalling state of the graves that the mine had promised to take care of. What was then agreed upon was that even the respected traditional authorities participate in these diabolical acts which suppress people and undermine their ancestors. According to the mine this is a grave with a tombstone but where are the dates? The women witness graves without the tombstones promised by the mine. 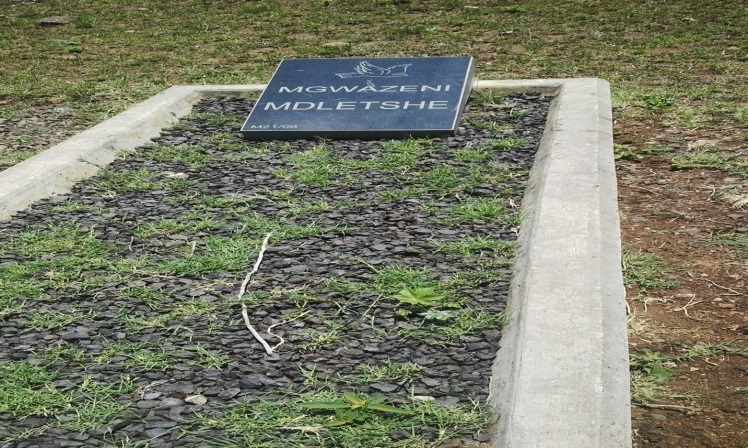 Who is buried here? The church in Machibini packed to its rafters. The next day, 22 January 2014, we drove to Ocilwane. We did not meet as usual in the community hall but this time we met in a church building not too far away. The community hall was not available to us because the ward councillor refused to hand over the keys. The meeting in Ocilwane was all about sharing messages of solidarity from the different countries as well as provinces. It ended at 12h00 because the comrades had to leave not later than 13h00 to get back to Johannesburg. On their way down to KZN they spent more than 12 hours on the road which was strenuous as well as nerve wracking for all of us, even those of us who were not travelling with them. As a result, we wanted to ensure that they left early.